After 59 combined years in practice representing the injured, we can look back and say it has been our pleasure to meet and work with so many wonderful and deserving clients. What still amazes us to this day is how so many of our clients struggled with the thought of calling a lawyer after being injured. Despite the fact they were injured as a result of someone else’s negligence or reckless behavior, they still struggled with making the call. Thankful for the opportunity to have guided many through the challenges of being injured (medical bills, wage loss, vehicle damage, struggling with the activities of daily living, impact on relationships with family and friends), we are sure they would advise any “potential client” that contacting a lawyer is the right call. Let us share with you some of our observations as to the reasons behind the hesitation, in hopes of making the decision to contact an attorney a “no-brainer”. One of the reasons attorneys never get the call from the injured potential client is that the insurance company for the at-fault driver has pounced on them to settle immediately. The sometimes-irresistible offer of a cash settlement is often made within hours or days of the motor vehicle accident. If the insurance adjuster can get to the injured person before they have contacted an attorney, the chances of settling the case on the spot are much higher. Why would someone settle their claim so quickly before knowing the extent of their injuries? The truth is that unless you have been in a motor vehicle accident before, you may not be aware that it can take not just hours, but days and weeks before the full extent of one’s injuries may be known. For the person struggling financially to make ends meet the insurance company’s offer of a cash settlement can be the answer to a prayer. The minor aches and pains they may be experiencing at the time are viewed as temporary, and certainly no reason to pass up the “opportunity” of making this month’s rent payment or mortgage payment. In exchange for the cash the injured person must sign a document known as a release. By signing this document the injured person gives up any and all claims they may have against the at-fault party, now or in the future. Even if the injuries become serious and disabling over time, the injured party is typically stuck with the short-sighted deal they made with the insurance company. Since this person never contacts an attorney it is difficult to estimate how many individuals succumb to this “deal”. In fairness, clients over the years have shared stories of upstanding insurance adjusters advising injured persons to consult with an attorney before settling their claims. Whether or not such advice is offered, the injured person must take personal responsibility for the choices they make. Choosing to contact an experienced personal injury lawyer before settling one’s claim is always the right call to make. Such a call is always free to a client. For many of those that do ultimately contact a lawyer, the decision to even reach out to a lawyer was not an easy one. In our experience, the number one reason why potential clients hesitate to reach out is that they are embarrassed. They do not want their lawyer to think that they are “one of those kind of people” (finger quotes added). What do they mean by “one of those kind of people”? They do not want to be confused with the person that is pursuing a frivolous claim, or the person that is pursuing the claim in an effort to “win the lottery”. We have had this very conversation with so many clients over the years that we jokingly remark there must be a book out there telling clients what to say to their personal injury attorney. These clients need to be assured that an ethical attorney would not take a case that is frivolous (or lacks merit). A legitimate case is one where the other party is at fault for the accident and the injured party is truly injured. Injuries can run the spectrum from bruises to those injuries causing death. The ethical lawyer is also going to assure the client that this is not about “winning the lottery” for the client or the lawyer. As we explain to clients, our role as your lawyer is to even the playing field. The insurance company is looking to resolve every claim for as little as possible. Your lawyer is here to protect you from being taken advantage of, and to make sure that you are treated fairly and reasonably in the process. There is no down side to reaching out for an attorney sooner rather than later in the process. There is no need to be embarrassed. We are here to protect you and to ensure that you are treated fairly. We are even here to tell you when you do not need a lawyer. So keep in mind that contacting an experienced personal injury lawyer is always free, and is always the right call to make. 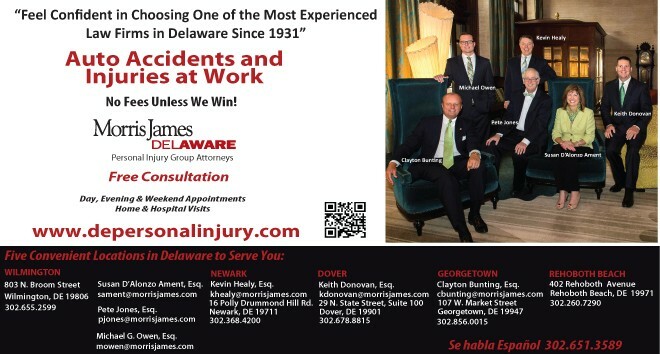 Kevin G. Healy is a founding member of the Morris James Personal Injury Group, with over 28 years of experience in the area of personal injury litigation. He has dedicated his practice to the representation of individuals injured as a result of the negligent or reckless conduct of others, including auto accidents, truck accidents, motorcycle accidents, pedestrian accidents, bicycle accidents, and premises accidents.